View All Bios View my Rootsweb DB for GOERDT, SR. The Goerdt family came from Westphalia in Germany where a Goerdt farm in the little village of Laer near the city of Bochum has been handed down from father to son for generations. Theodore Goerdt Sr. was born on 14 October 1824. In Theodore's generation, the eldest son, William, inherited the entire homestead according to old German law. The two younger brothers, Karl and Theodore, decided to come to America. 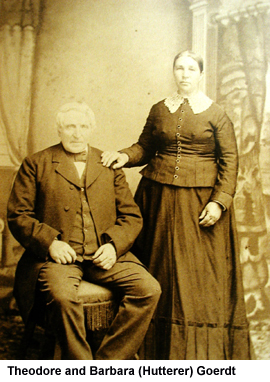 Theodore arrived first, to Dyersville, Iowa in 1850, where he met and married Barbara Hutterer (married on 03 September 1850), who had come with her parents from Bavaria, Germany in 1848. (Barbara's mother died on the voyage to America.) Theodore's brother Karl came two years later, in 1852. Both brothers farmed and prospered for many years near Dyersville, Iowa, where Theodore passed away at the age of 87 years in 1911. Barbara had passed away in 1904. Theodore and Barbara had 13 children.